Something so cool about this video…I think I am responsible for 80 percent of its hits. 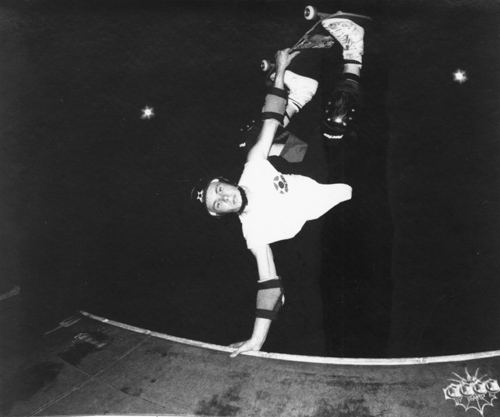 This entry was posted in 1992, Jason Lee and tagged 1992, ART, backyard ramps, boards, east coast, house of steam, jason, Jason Lee, Jason oliva, jasonoliva, New Jersey, New York City, oliva, paintings, photography, pool Skating, ramp, ride, sk8, sk8t, skate, skate decks, skate history, skate photography, Skate ramps, skate trucks, skate wheels, skateboarding, skateboarding history, skateboarding photography, skateboards, skatepark, skater, SKATERS, steam, Stereo Sound Agency, Street Skating, TEAM STEAM, The Barn, The House of Steam, thos, vert, vert ramps, Vert Skating on February 11, 2009 by jasonoliva. 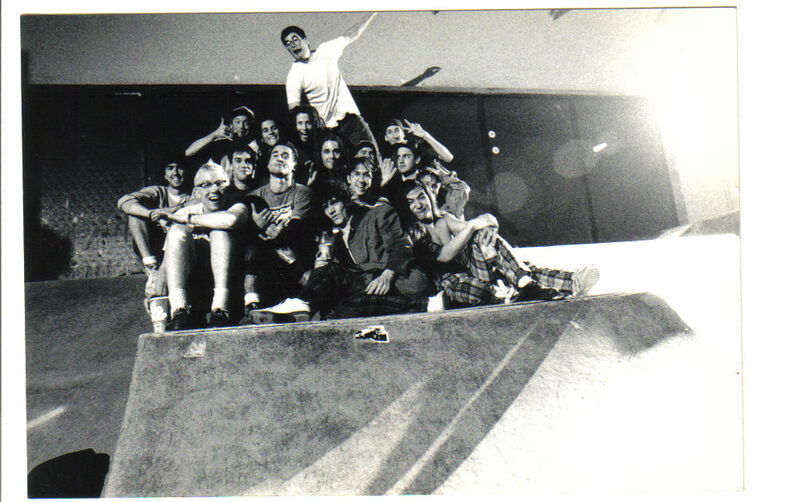 This entry was posted in 1992, Jeff Phillips and tagged ART, backyard ramps, boards, brotherhood, east coast, house of steam, jason, Jason oliva, jasonoliva, Jeff Phillips, New Jersey, New York City, oliva, paintings, photography, pool Skating, ramp, ride, sk8, sk8t, skate, skate decks, skate history, skate photography, Skate ramps, skate trucks, skate wheels, skateboarding, skateboarding history, skateboarding photography, skateboards, skatepark, skater, SKATERS, steam, Street Skating, TEAM STEAM, The Barn, The House of Steam, thos, tracker, vert, vert ramps, Vert Skating on August 24, 2007 by jasonoliva. 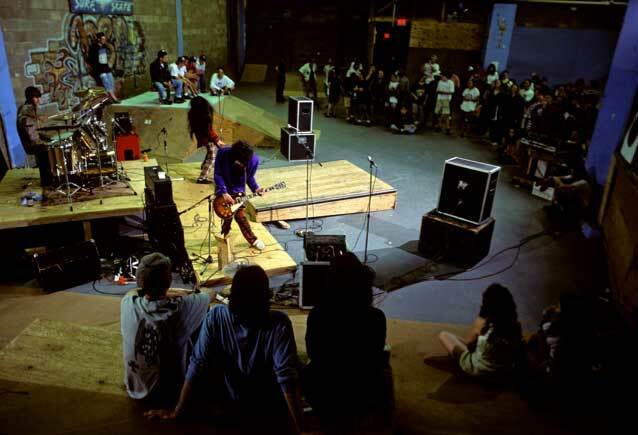 So this looks to be around 91-92 The Raging Lamos played at the indoor park in Brick Township… Ill let dennis tell it..
Geoff Graham foto on the timer, getting in one last stage dive. Rounding out the roll call: Kelly Ryan; Rocky (Vertone), (Jim) Murphy, Dennis (Kane), Charno (Rick Steamboat Charnoski), Moose (Darren Menditto), (Dan)Tag, me (Jimmy Kane) , Barker, Weep (Chris Blank), Jason (Oliva), Al B(aker), Steve D, Dr K and Billy (Collectivelly known as The Raging Lamos). I cant get enough of this photo!! Who new it would take 15 years before I would meet Ken Salerno and he was there snapping pics the whole time. 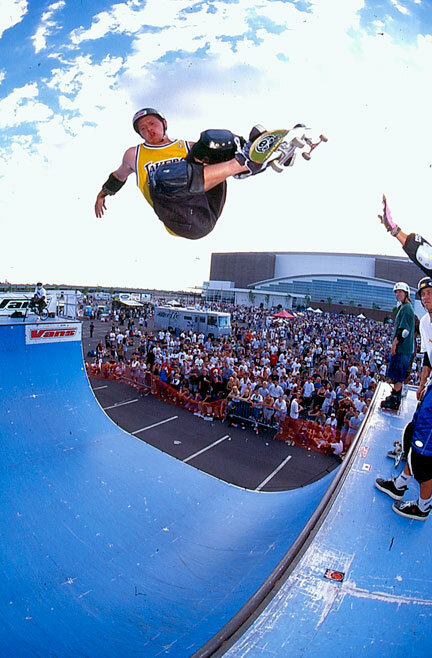 This entry was posted in 1991, 1992, Al Baker, Barker Barret, Dan Tag, Darren Menditto, Dennis Kane, DJ KING WEEP, DJ VertOne, Impact Zone, Jason oliva, Jimmy Kane, Kelly Ryan, Photos by Geoff Graham, Photos by Ken Salerno, Rick Charnoski, Rocky Vertone, SKATE PARKS:, SPOTS:, Stevie “D” Manion, TEAM STEAM, The Raging Lamos, Weeps and tagged ART, backyard ramps, boards, ditch skating, east coast, ian reilly, Impact Zone, jason, Jason oliva, jasonoliva, New Jersey, New York City, oliva, paintings, photography, pool Skating, ramp, ride, sk8, sk8t, skate, skate art, skate decks, skate history, skate photography, Skate ramps, skate trucks, SKATE VIDEOS, skate wheels, skateboarding, skateboarding history, skateboarding photography, skateboards, skatepark, skater, SKATERS, steam, Street Skating, TEAM STEAM, The Barn, The House of Steam, thos, vert, vert ramps, Vert Skating on July 16, 2007 by jasonoliva. 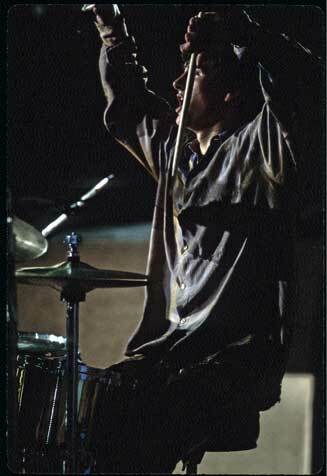 82: In 1992 scientists gather enough Steam power in one New Jersey strip mall skatepark to catapult an elephant over a seventeen story building. Geoff Graham is there to photograph the accomplishment. Yo Jay! I’ve been holding off on a post until I dug something good out of the archives, just found this little gem! One of the greatest gatherings of post-barn STEAM power I can recall. 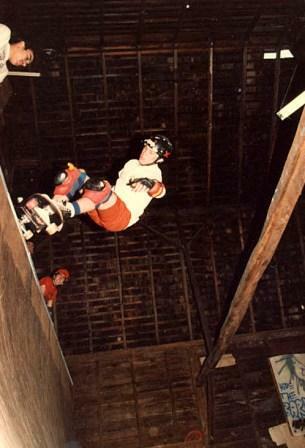 It was late 92, in Brick NJ there was an indoor skate park in a strip mall. The other end of the mall had a roller-disco rink. 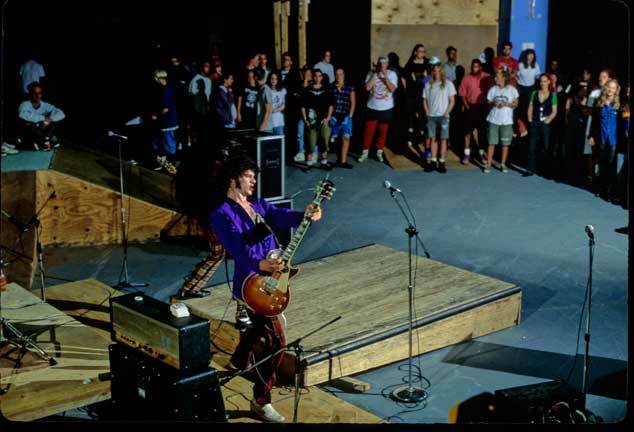 There was some kind of contest/jam, completely dominated by the steam presence,…the climax of which was a rock and roll onslaught by the RL’s, set up on the flat bottom. You can tell by the faces that a good time was had by all. Geoff Graham foto on the timer, getting in one last stage dive. Rounding out the roll call: Kelly Ryan; Rocky (Vertone), (Jim) Murf, Dennis (Kane), Charno (Rick Steamboat Charnoski), Moose (Darren Menditto), (Dan)Tag, me (Jimmy Kane) , Barker, Weep (Chris Blank), Jason (Oliva), Al B(aker), Steve D, Dr K and Billy (Collectivelly known as The Raging Lamos). 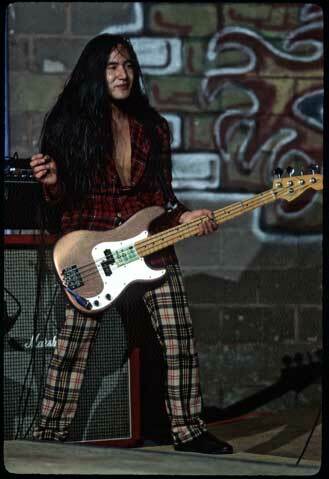 This photo rules! It says alot for sure. The winds of change sure did scatter us all soon after this photo was taken. Here is the question I am pretty certain this was not the event but there was a similiar occasion we all went to a south Jersey strip mall skatepark for a contest. Tom “The Rock” Boyle (ummm someone please send photos of Boyle!) 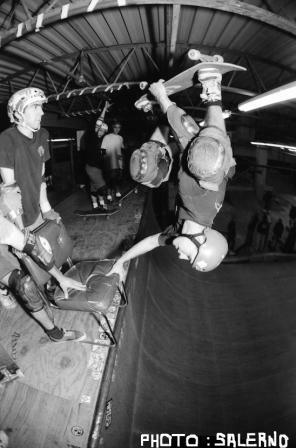 had beat Tony Hawk in a mini ramp contest in Florida so Tony Hawk showed up in Jersey for this event to set the record straight or something (real gunslinger stuff goin down) So anyway we (handful of peeps, definetly Steamboat) all went to another nearby (closed) indoor skatepark with an in ground wooden bowl. While we were skating Tony Hawk (wearing a ski hat over his helmet…wish I thought of that years earlier) and 2 young kids show up. Needless to say Hawk went off skating the bowl doing crazy stuff (but nothing as bulldozey as Charno’s boardslides). So who remembers all this? This entry was posted in 1992, 2. SKATE SPOTS:, Al Baker, Barker Barret, Dan Tag, Darren Menditto, Dennis Kane, DJ KING WEEP, DJ VertOne, four 4, Geoff Graham, Jason oliva, Jim Murphy, Jimmy Kane, Kelly Ryan, Photos by Geoff Graham, Raging Lamos, Rick Charnoski, Rocky Vertone, SKATE PARKS:, SPOTS:, Stevie “D” Manion, TEAM STEAM, The Raging Lamos, Tom “The Rock” Boyle, Tony Hawk, Uncategorized, Weeps and tagged Al Baker, ART, backyard ramps, Barker Barret, chris blank, Dan Tag, Darren Menditto, Dennis Kane, DJ KING WEEP, east coast, Geoff Graham, jason, Jason oliva, jasonoliva, Jim Murphy, Jimmy Kane, Kelly Ryan, New Jersey, New York City, oliva, paintings, photography, pool Skating, ramp, Rick Charnoski, ride, Rocky Vertone, sk8, sk8t, skate, skate history, skate photography, Skate ramps, skateboarding, skateboarding history, skateboarding photography, skateboards, skatepark, skater, SKATERS, steam, Street Skating, TEAM STEAM, The Barn, The House of Steam, thos, Tom "The Rock" Boyle, Tony Hawk, vert, vert ramps, Vert Skating, Weep on December 1, 2006 by jasonoliva.